“Upgrade WAVE” sales event on cruises in Alaska by Norwegian Cruise Line continues with incredible savings on Norwegian Sun sailings. Guests who book a seven-day cruise vacation in Alaska on board Norwegian Sun will receive $100 to spend on board or $150 to spend on board for 14-day sailing, regardless of stateroom category, this limited time offer is only available today and tomorrow, March 1, 2013. Explorers will also be eligible to take advantage of the line’s Wave Season offers including free balcony upgrades, up to $500 in air credits, and e-coupons worth more than $300 in on board savings. For a limited time, families can also enjoy additional savings, as the line is offering 50% off cruise fares for kids ages 17 and under, who are sailing with two adults in a stateroom and guests who book a Cruisetour will receive an additional $100 on board credit. This spring, Norwegian Sun will set sail to Alaska from May 13, 2013 through September 9, 2013, offering a series of seven-day cruises from Vancouver, British Colombia or Whittier, Alaska. Norwegian Sun’s northbound itinerary departs Vancouver beginning on May 20, 2013 and will cruise the Inside Passage, Glacier Bay and Hubbard Glacier and make stops in the Alaskan favorites of Ketchikan, Skagway and Juneau with fares starting from $499*. Beginning May 27, 2013, on her southbound itineraries from Whittier, the ship will cruise the Inside Passage, Sawyer Glacier and Hubbard Glacier, as well as make stops in Ketchikan, Skagway, Juneau and Icy Strait Point, with fares starting at $429*. Those looking to explore the magnificent beauty of Alaska on a longer vacation have the option to cruise on a back-to-back sailing from Vancouver or Whittier, with fares from $879*. This option will allow guests to experience the marvels of both itineraries and cruise the Inside Passage with calls in Ketchikan; Juneau; Skagway; Glacier Bay; Hubbard Glacier; Whittier; Icy Strait Point and Sawyer Glacier. Adventures and amazing views of wildlife abound in Alaska. New for the 2013 summer season are four incredible Cruisetour options, providing guests the opportunity to combine a pre- or post-cruise land package with Norwegian Sun’s cruises from Whittier. Ranging in length from four to six days, Cruisetours feature two nights in Denali National Park and are fully escorted by a local Alaskan tour guide for the most authentic experience possible. 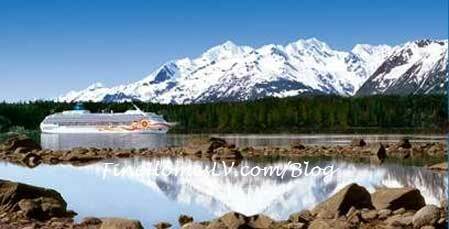 Highlights of the Cruisetours also include a stop at an Iditarod sled dog musher’s house (on four and five-night tours), along with a ride on the Alaskan railroad. For a limited time, guests who book a Cruisetour will receive an additional $100 on board credit.